Democratic former East Harris County congressman Chris Bell wants to take on Republican Gov. Rick Perry badly enough that he isn’t waiting to see if U.S. Sen. Kay Bailey Hutchison runs for governor instead of reelection. Bell, a Houston city councilman who lost a mayor’s race before winning a seat in Congress, has set up an exploratory committee. He can’t wait to see if former Comptroller John Sharp or the 2002 nominee, Tony Sanchez of Laredo, or former Austin Mayor Kirk Watson, will chance running if they might wind up facing not Perry but Hutchison, or Comptroller Carole Keeton Strayhorn. Neither woman can cut into Perry’s support from “the far right wing” enough to beat Perry in a Republican primary, but can “bloody” him, Bell said. “I just don’t want to have Rick Perry come staggering out of a Republican primary with us standing there with no one ready to go,” Bell said in an Austin interview. He thinks Perry’s beatable. Bell, 45, said once-proud Texas now seems in a downward race with Mississippi and Arkansas to rank last in category after category of services. Bell lost the 2004 Democratic primary to former Justice of the Peace Al Green, an African-American, after redistricting engineered by House Majority Leader Tom DeLay and Texas House Speaker Tom Craddick and aided by Perry — in special legislative sessions called by Perry — drew a district to almost guarantee that result. Bell filed an ethics complaint against DeLay. It had little impact on the man known in Washington as “The Hammer.” But Bell said people from across the nation offended by DeLay’s heavyhandedness contacted him. He’s traveling Texas, hoping to capitalize on the Internet-organized infrastructure developed in 2004 by the Howard Dean presidential campaign. “I think that the internet is the new grass roots,” said Bell, whose website is http://www.ChrisBell.com. He’ll also court voters other than lock-step Democrats, who often make the mistake of “pretending that people will come to us,” Bell said. Bell hopes independents who voted Republican for the last decade decide Perry’s performance justifies backing a Democrat. He’s also counting on the media and public spotlight a governor’s race attracts far more than down-ballot races. “We know there’s never enough money to solve every problem, but refusing to take responsibility for dispensing hope betrays a bankrupt spirit,” Bell said. He said “ignoring problems and refusing to consider new solutions (and) evading our fiscal and moral responsibilities so we can brag about budget issues” punishes the future of Texas. Bell, a moderate, hopes to erase the hard-core partisanship in today’s Washington, and move more toward bipartisanship. “I have no desire to spend the rest of my adult life stuck in a partisan trench, never giving an inch toward common ground,” Bell said. “The New Mainstream includes all of us who believe in rewarding hard work, recognizing new ideas and relying on each other and ourselves,” Bell said. “Rick Perry leads a government that no longer reflects the ethics and values of the New Mainstream,” but rather of a “divisive” partisanship. Perry spokesman Luis Saenz didnt seem nervous about Bell. “He just lost a Democratic primary, and he’ll have to go through that process again,” Saenz said. Bell disagrees that Texas is irrevocably a conservative Republican “red” state. In the past three years, states “far more conservative than Texas,” including Kansas, Oklahoma, Montana and Wyoming, have elected Democratic governors, Bell said. He hopes Texas will join them. Summer will officially be here come June 21st but I beg to differ; its here now in my book. Its hotter than a firecracker and even hotter in front of the stove making blackberry jam (seedless) this morning. Five cups of berry juice, seven cups of sugar and a package of pectin produces five and a half pints of the sweet jam. Good on those whop biscuits too, tis. Fat free of course! One of the four Confederate Roses is in bloom and looking good. The large flowers are white in the mornings turning very reddish-pink in the evenings. The flower is as large as a Hibiscus. The Confederate Rose looks more like a small tree or shrub than a true rose with thorns. Not sure how it got the name. It is also one of the few things grown here that you cannot eat. The briar patch was turned over to the Mockingbirds today after our last picking of blackberries for the season. They eat their fair share of the blackberries and turn the leaves white. The granddaughters will be here this time next month and their father asked me to prepare a batch of chowchow while they are here. Then he wants me to take some photos of their expressions when they smell it cooking. Reckon he is referring to the strong vinegar and hot pepper aroma filling the house as it is boiling. Recall he didnt stick around long after he got his first whiff. Remember well how it was as a chap back in Georgia, out on Liberty Hill Road this time of year or there about. No air conditioner mind you and the pressure cooker on the stove was huge and secured by a metal band clasp. They treated it like a bomb and shooed me out of the kitchen dare I go in the house that way. Old aunts were canning string beans at the time and the canning of tomatoes stunk too. Not to mention they were busier than a bee and ornery as a hornet. Between the heat, hornets and odor, I got out of the house. From the back porch one could see a fire tower way out to the right, but only the top part of it because of the trees. Over time the trees blocked the view of the fire tower completely because it was way out across the river near Wares Cross Roads. Never got to go up in that fire tower, but did have the opportunity to go in one when I was in Scouting with the boys. Would not want to do all that climbing this day and time, but it was most interesting back when. They take forest fires seriously and you should too. The house on the hill on Liberty Hill Road was 14 miles from town. The road was dirt, red dirt and the Kudzu & trees on side of the road would be red from the dust created by passing cars, maybe three or four vehicles a day would pass. One would wait by the window to see who it was. Me and two more boys rode out there once on bicycles when I was about 12 – 13. Never do that again. Too hard to pedal up one of those hills and we had to push, mercy! Like a lot of things, that hill has good and bad memories because my father died at the bottom of it when he was younger than me. Would he be surprised this day and time or what? CROSBY — On May 20, Crosby resident, David McNerney, graciously accepted local recognition for having received the Congressional Medal of Honor near the Indian Shores Road cross street on FM 2100 by the Crosby VFW #9761, American Legion #658 and the Crosby/Huffman Chamber of Commerce. This dedication of a sign (made by Lone Star Signs) was placed on land bestowed by James Lee, owner of the Shell Station there. It seems appropriate to remember the great deeds of men that enable a republic to bestow the blessings of freedom to its residents, the reason for Memorial Day. McNerney a very private person was reluctant to attend the ceremony, according to all of Joe Anselmo, Don Guillory Commander Crosby VFW #658 and Tom Devlin of the VFW #9761. They had convinced McNerney that it would be too much fanfare. The nations most prestigious award was bestowed for McNerney’s service in the U.S. Army at Polei Doc, Republic of Vietnam on March 21, 1967, in keeping with the highest traditions of the U.S. Army. The ceremony was organized and directed by Joe Anselmo for the Chamber and American Legion #658, invocation was by Pastor Richard Amador of Harvest Son Church. Huffman JROTC posted the colors and Barbara McPhee sang the Star Spangle Banner. 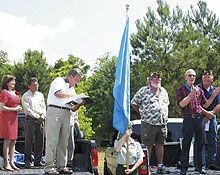 The event was highlighted by comments and reading of the Medal of Honor Citation from Don Guillory, Commander of Crosby American Legion #658. Not only were Precinct 3 Constable Deputies on hand to handle traffic, Constable Jones, himself and deputies were in attendance. State Representative Joe Crabb was represented by Phillip Ivy and Congressman Ted Poe by Amy Blanchett, who bestowed a congratulations. According to the certificate for the Medal of Honor, McNerney’s actions involved establishing defensive perimeters with his unit while under attack by a battalion of North Vietnamese regulars. He slew several enemy at close range, was wounded by a grenade. Persisting although injured by destroying a machine gun nest, he assumed command of the company when his commander was slain, and adjusted artillery fire to within 20 meters to fend of superior numbers of assaulting enemy. McNerney was exposed at all times to heavy enemy fire during the incident. Calling in air support, the company marked their position by smoke grenades. When those smoke grenades depleted, McNerney marked their position in a nearby clearing to signal air support, then he climbed a tree and tied the company’s panel to the highest branches. During the firefight, McNerney readjusted the companys position, encouraged defenders and checked the wounded. Later, when the assault had slackened it was discovered that large trees must be removed to evacuate the wounded. McNerney crawled from the relative safety of the defensive position to take explosives from abandoned rucksacks and drew exceptional enemy fire. McNerney in spite of painful injury did not leave his unit until a new commander arrived the following day. Mike Amador, Angella Amador, Jerry Blizzard, Phyllis Amador and Pastor Richard Amador hold up signs they are erecting on FM 2100. On May 23, members of Son Harvest Church are placing signs honoring veterans from throughout the Huffman, Crosby and Barrett Station areas on small signs commemorating their service in herald of a special dinner to be served to veterans on May 29 at the American Legion Hall between 4:00 p.m. until 6:00 p.m.
CROSBY — A new board member has been acccepted by Harris County to lead ESD#5, the ambulance service for Crosby  Larry Lee Hall comes with a new vision for the service and strong feelings for the needs of the community. An interview with Larry Hall is an insight into how local leaders emerge in times of crisis. Why did this individual step up to take this thankless and payless position? Hall sees this situation as an opportunity to open up the emergency medical service to volunteers especially from Barrett Station. Discussion has been established at the ESD#5 board that the huge area of Crosby ISD (the same area as ESD#5 is charged with covering) would need a second ambulance to assure quick response. The paid crews currently on duty now are achieving two minutes faster response time than national average of 10 minutes but on any given Saturday night, more than one call for medics can come in at a time for all surrounding communities, potentially leaving a shortfall in ambulances. The district cannot afford two paid ambulance crews. EAST HARRIS COUNTY — The culmination of 13 years of schooling will come to close this weekend as seniors from Crosby, Highlands and Huffman walk across the stage and receive their high school diplomas. Crosby will hold its commencement ceremony on Thursday at the M.O. Campbell Center, 1865 Aldine Bender Rd. in Houston, beginning at 7 p.m. The class of 229 students will be led by Valedictorian Jonathan Englett. Claire Ward is the Class of 2005 salutatorian. Rounding out the class Top 10 students are: third, Jason Petitt; fourth, Heather Schexnayder; fifth, Matthew King; sixth, Ryan Alan Martinez; seventh, Andrew LeJeune; eighth, Emily Williams; ninth Melanie Fischer and tenth, Randy Johnson. Highlands students will have to wait until Saturday to take that final walk. Their ceremony will be held at Stallworth Stadium, at the corner of Archer and Sjolander Roads at 8 p.m.
Delivering the valedictorial address will be Kristen Alexander. Byoung Kang is the class salutatorian. Also ranking in the top 10 are: Marissa Jensen, third; Tony Castilleja, fourth; Blake Johnson, fifth; Magali Hernandez, sixth; Rachel Shaver, seventh; Richard Thomson III, eighth; Linda Aguilar, ninth; and Rajiv Jaini, tenth. Like their neighbors to the south, the Hargrave Class of 2005 will hold commencement at the Campbell Center. Their ceremonies will be Sunday at 7 p.m.
Hargraves top 10 are: Joel Burgess II, valedictorian; Jenna Rose Ascheri, salutatorian; Amy Katherine, third; Christina Beth Kidd, fourth; Tayrn Nash, fifth; Andrew Stein, sixth; Nina McGraw, seventh; Jarrod Burt, eighth; Carli Martin, ninth and Samantha Peacock, tenth. HIGHLANDS — Jim Strouhal presented an update to plans for the restoration of the Highlands Railcar #524, and Margie Elliott talked about the museum project and memorial wall that will be built at the site of the Highlands Chamber building. 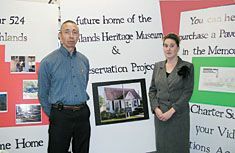 Strouhal is one of the founding members of the Highlands Heritage Museum and Preservation Project, along with Roy & Margie Elliott, John Richardson, Vern Miller, Alton Neatherlin, Gary Wiggins, and Harry Johnson III. The railcar now sits in the backyard of Mrs. Johnson on Battlebell Road, and volunteers are needed to help with the restoration work, Strouhal said. Current work includes cutting away and replacing steel members of the car, and rebuilding windows. The windows are being built by a restorer in Dallas who specializes in this type of work. Business at the luncheon included approving new bylaws, that gave 501c3 status to the Heritage project. According to Roy Elliott, the Heritage projects will benefit from this tax exempt status, allowing more personal and corporate contributions. Strouhal started his presentation by telling about the history of the Highlands/East San Jacinto area, based on new material that has been surfacing in the museum project. He reviewed the land grants, indian settlements, French influence, and the influx of Anglos in the 1880’s. Ship building was a major activity in Lynchburg at this time, he said. In the 1900’s William Terrell brought farming and canning to the area. In the 20’s Harry K. Johnson Sr. founded the Houston Northshore Railway. This history is available in a book for sale at the chamber. Car #524, known as the Highlands car, was the last car to run on the system, and holds significance and much nostalgia for this reason. CROSBY — A perfect Spring day and all the breeze one could ask for made last Thursday on the Crosby Fair & Rodeo Fairgrounds an ideal picnic setting. Local sentiment in favor of higher standards for education by the business sector found theater in the Texas Scholars Luncheon hosted by the Crosby/Huffman Chamber of Commerce. Students from Crosby High and Huffman’s Hargrave High School that took the curriculum required to earn the Texas Scholars designation and achieved at least a C grade point average were treated to some barbecue chip sandwiches, snacks, sodas and a bevy of prizes lavished by local businesses on May 12. 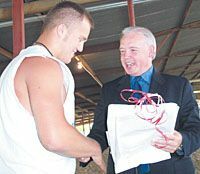 Steve Myers, Superintendent of Huffman ISD, congratulated students on their accomplishments. Dr. Don Hendrix orated on the realities of graduation being a beginning, the probabilities of distraction from purpose in junior college and unique challenges for those entering the employment market now or in the near future. See page 8 for pictures of both schools’ classes. CROSBY — One the best seasons for the Crosby High baseball program over the past few years came to a close this past weekend with a pair of losses to the Brenham Cubs in a best-of-three series. Crosby ends the season with a 20-7 record. An inability to bring the runners home hurt the Cougars in the opening game, as they lost 8-0. The Cougars strung together eight hits, but could not convert those hits into runs stranding 12 baserunners. The long-ball sounded the death knell for Crosby in game two, as Brenham hit three home runs en route to a 11-3 victory. Crosby fell behind early as Trey Buck gave up a solo homer in the bottom of the first inning. The home run was an aberration for Buck, who threw a no-hitter a week earlier to clinch the district title for Crosby. In the bottom of the second, Brenham picked up four hits, scoring twice more for a 3-1 lead. Crosby got onto the scoreboard in the top of the third inning when Derrick Dalcour drew a walk. The fleet-foot Dalcour scored from first on a single by Eric Swendsen. 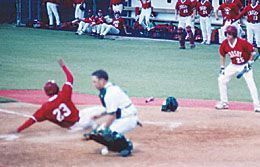 The flood waters hit in the bottom of the third inning when Brenham loaded the bases with a single, a walk and a bunt. The next batter went deep to give the Cubs a 7-1 lead. The Cubs would put one more run by the end of the inning. Shannon Talbott led off the top of the fourth inning with a single. He later scored on a sacrifice by Eric Ledvina. In the bottom of the fourth, the Cubs added two more runs for a 9-2 lead. Kolby Kidder made it a 9-3 game in the top of the fifth when he took first after being hit by a pitch. The Cubs pitcher tried to pick Kidder off, but the throw was wide and he was able to score on the error. Dusty Ashworth, who pitched the bottom of the sixth for Crosby, gave up a two-run homer to give Brenham a 11-3 advantage. 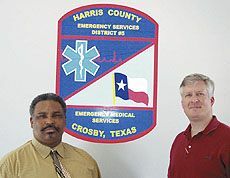 CROSBY — The First Annual Crosby Volunteer Fire Department Cook-Off “Friends, Family & Fundraising” will be held on Friday and Saturday, June 24 and 25 at Texas Wild on FM 1942. All proceeds from this fundraiser will benefit the CVFD. This event will be for all ages. For children there will be a Moonwalk, face painting, sno-cones and more. Adults can enjoy live music, good food and cold beverages. The CVFD has had only one fundraising event in the past two years, the Annual Hot Shotz Golf Tournament, which began in 2004. The majority of the CVFD’s monies come from taxes from homeowners, which is .05¢ per every $100 valuation. The CVFD has increased the number of Stations in the Crosby area from two Stations to five Stations to better protect the outlying areas of Crosby and assist homeowners with lower Homeowners Insurance Policies by obtaining a lower ISO rating. Did you know the CVFD consists of ALL volunteers? Approximately 53 men and women from our community volunteer their time and efforts to protect your land, homes, children and businesses. The Volunteers are responsible for Crosby & Barrett Station, which encompasses 103 square miles. They also handle Mutual Aid calls for Harris County, more specifically, Highlands, Huffman, Sheldon, Channelview and Dayton. Entry fee is $100 for a 20 x 30 space which includes electricity and water. Cooking categories will be Fajitas, Chicken, Ribs, Open Side Dish and Brisket, with 1st, 2nd and 3rd Place Trophies and cash prizes for 1st Place Brisket, 1st Place Ribs and 1st Place Chicken. If you have a team that would like to participate or for more information please contact Joe Anselmo at 281-328-4598 or 281-328-7173 or you can call the CVFD at 281-328-2300.